All of our tubes are made from the highest quality PAN based carbon fiber available. Also, we do not use "seconds" or "blems" found at surplus sites on the net. This is first-quality, aerospace certified material direct from the (USA) manufacturer. The carbon fiber is compression wrapped in a hi-temp epoxy matrix and cured at 160 degrees over a precision mandrel. The OD of the tube is epoxy coated and precision ground before urethane clear-coating and polishing. The tube is cut to length while still on the mandrel to assure squareness. Tube OD tolerance can be held to +/- 0.010" even on our largest diameters. Wall thickness can be held to +/- 0.005". There are two basic types of telescope tubes available: solid wall and composite wall. The competition’s composite tube typically has 2 very thin layers of carbon sandwiching some sort of core material such as foam or honeycomb. A typical composite tube has a wall thickness of 5/8" or more. Composite construction is very advantageous in many applications such as airplanes or boats due to its rigidity and light weight, but NOT in telescope construction. The problem with composites is that you cannot bolt assemblies through a composite wall without some sort of pre-engineered hard-point or insert. Torquing a bolt of any size through a composite tube will collapse the core and destroy the local integrity of the tube. Without a predetermined hard-point or insert, you can easily drive the head of even a small bolt right through the outside wall of the tube and destroy it. In addition, the ends of the tube or any opening cut into the tube will expose the soft core material and must be sealed and protected somehow. All of these things must be considered before the tube is built, leading to very high engineering and fabrication costs. Once the tube is built, you cannot "change your mind" about length or hole locations. Our solid wall tubes are many layers of carbon fiber making up the tube wall; there are NO fillers or core. Therefore our tubes can be cut, drilled, slotted, tapered, etc. without the worry of exposing a weak core. You can torque a bolt through our tube as tight as you want without worry. In fact, the bolt will likely snap or strip before our tube shows any compression damage. If you drill your hole a bit off-target, just grab a round file and elongate the hole a bit to make it work. Axial rigidity is not an issue with either construction method. Radial rigidity is established by the basic telescope components including rear/front cell, spider, etc. Another advantage of our solid wall tubes is impact resistance. Accidents can and will happen, particularly at 6:00 AM after a long night of imaging. Our tubes can withstand considerable impact without damaging the structural integrity of the tube. A thin wall composite tube is MUCH less forgiving and is easily damaged by impact. Don't take our word for it, ask us for a sample and we'll send one out to you. Ask the composite core tube guys for a sample of their tube as well and compare for yourself. Oh, did I mention the beautiful finish of our tubes? Our Premium carbon fiber tubes are clear-coated with two-part, automotive grade urethane. The clear-coat is baked at 150 degrees to full cure before it is polished to a mirror finish. The particular clear-coat we use has very good UV blocking agents to greatly reduce the degrading effects that UV radiation has on the epoxy resin. Be wary of any tube that does not have UV protection, they will begin to yellow very quickly and will eventually begin to degrade. Drilling a hole in our carbon tubing takes about 5 seconds with a good drill bit. Knowing exactly where to drill the holes (layout) can take hours. For our standard tubes, such as C-9.25, C-11, C-14, etc. we have reusable drilling patterns so all of these tubes come pre-drilled at no extra charge. There is an extra charge for drilling custom holes in custom tubes. The alternative is for you to drill the holes while assembling your custom scope. The carbon tubes can be drilled with any sharp bit in any power hand drill. Large holes, like those for focusers, require a good, fine tooth hole saw. Securely pay for a custom order here. Large carbon fiber tubes available in diameters up to 24"! 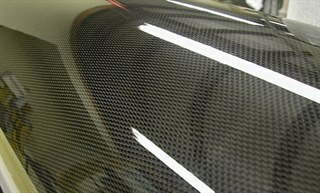 Carbon fiber is a simple and effective imaging solution. How would a carbon fiber tube help me with imaging? The answer is simple... As the temperature drops, your aluminum OTA tube is shrinking! This brings the primary and secondary closer together and moves your focal plane off the surface of your imaging chip. 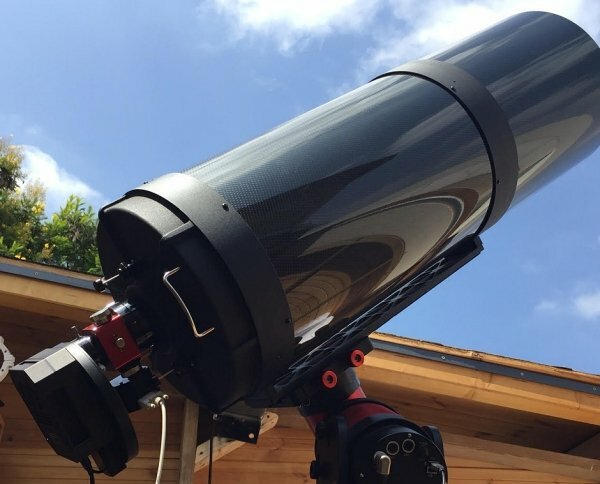 With a typical SCT, moving the mirrors by 0.001" can move the focal plane by as much as 0.025"! The result is a blurry image. Our goal is also simple... To provide you with a large diameter carbon fiber tube that does not shrink nearly as much as an aluminum or even steel tube thus making your imaging time much more productive and less frustrating. *Please note that each night is different and each night the temperature changes will vary. Also note that in most cases you will still need to re-focus when changing filters. Carbon fiber has vastly superior thermal expansion properties over aluminum. With a typical aluminum C-11, you need to refocus for every 1.5 to 2 degrees of temperature drop. Since the C-14 uses a longer tube, the effect is even greater. If you are shooting 10, 15, or even 20 minute exposures, you can stop after a few exposures and re-focus. This constant re-focusing can be bothersome and eats away at your actual imaging time. The effect is much worse when shooting very long (1-2 hour) exposures in narrow band since you can't stop and re-focus during the exposure. So most nights you simply can't shoot that long because your focus will change by the time a single exposure is completed. With a carbon tube, you can easily go 10 degrees without refocusing. During a typical Michigan night, the temperature can easily drop 2 degrees per hour. Hence, Ha exposures over 45 minutes were impossible. Now I can image most of the night without re-focusing. Take a look at the M-27 image I posted below. 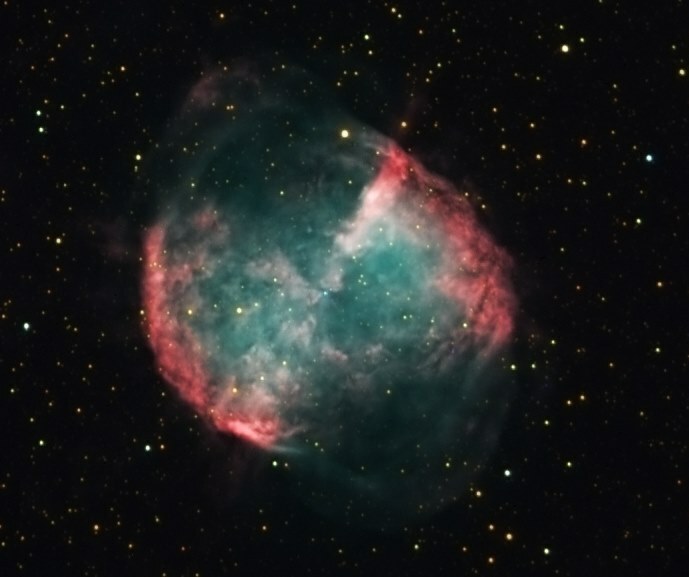 It is a series of 60 minute H-alpha sub exposures (plus RGB). I now consider the 60 minute Ha sub-exposures "short" and typically go with 90 and 120 minute subs. This was impossible for me without the carbon fiber tube upgrade. Carbon fiber typically saves 40% in weight over a similar aluminum tube. Weight is not as much of a factor with a typical SCT but it makes a huge difference with longer tubes such as an RC, and especially Newtonian or Classical Cass. Of course, if you are already pushing your mount (or your back!) to the limit, saving 3 lbs. on a C-14 is a good thing! Nothing has a better "wow factor" than a finely finished carbon fiber tube. Up close, it looks like a hi-tech 3D snake skin with amazing depth. When someone sees your carbon scope, they will know you are serious about the quality of your equipment.